I know a thing or two about dog beds. Albert, being a rather pampered hound, has chewed or dug his way through more than a few of them. And I think it's fair to say that they aren't generally aimed at a design conscious market, despite being available in a wide range of colours, fabrics and prints. So I was delighted to come across this range by Cloud 7, a new label offering fashionable, contemporary products and accessories for dogs and dog lovers. Designed to "meet the highest expectations of the pet owner's taste" as well as the comfort needs of your pooch, their beds come in two beautiful shapes and three different sizes. 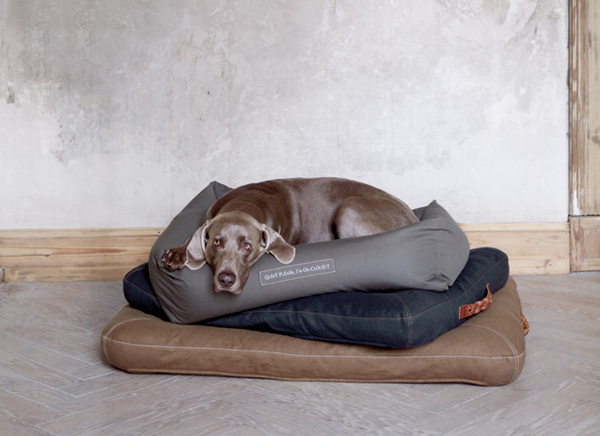 There's also an elegant travel bed - what appears to be a ladies bag at first glance, unfolds into a super comfortable place for your furry friend to rest while en route. If like me you are a dog lover, you'll know just how much a dog helps to make a house a home. These images of 'pets at home' with their owners captures this perfectly, reminding us of the important place they occupy in both our homes and our hearts.